Your safety and enjoyment while in our care is our primary aim. The following are a few basics for staying safe in the Northern Territory. Always follow the instructions given by your tour guide or operator, park rangers and the police. They know the potential hazards and are trained and experienced in keeping people safe in potentially unsafe situations. They may have seen something you haven’t seen, and acting immediately may be imperative to you safety and/or the safety of others. Board and exit watercraft only when advised it is safe to do so by the tour leader. Swimming: Swim only in designated, fenced pools. Open water is a red flag (no go) zone. Beware camo-crocs. Never walk close to or swim in open water areas e.g. the ocean, rivers and billabongs (lagoons). It’s not safe to do so, even if it the area is proclaimed as being “guaranteed croc. free” and there are other people swimming there. 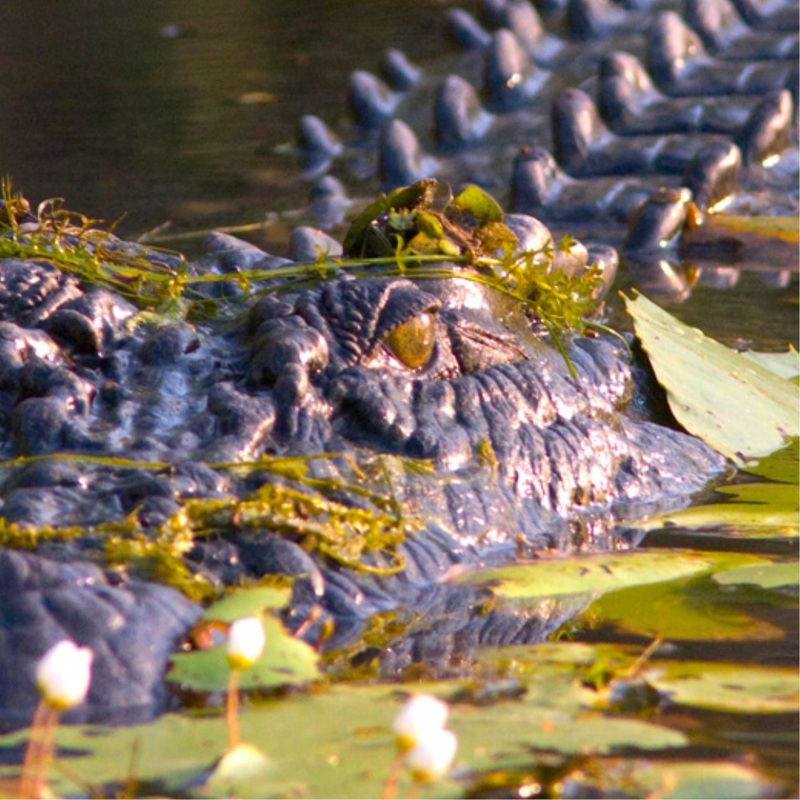 Crocs have legs and can move rapidly and effectively on land. They are excellent swimmers. They are experts at ambush attacks. They are intelligent, and territorial. 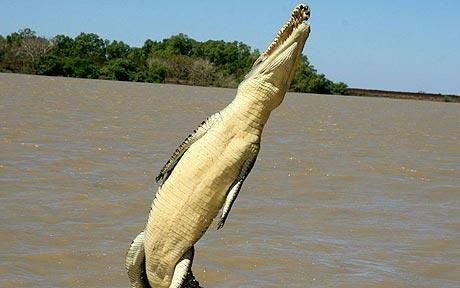 Who told the crocs they couldn’t move to the billabong (lagoon) that’s 50 metres from the main body of water? They may be lurking centimetres from the surface, but you can’t see them. They can move just below the water’s surface without disturbing the surface. The water may look tempting in the tropical heat, but venturing in is not worth the risk. Fishing: Do not fish from the shore. Doing so may put you on the crocodilic lunch menu. You may see others doing it, but we highly recommend you ovoid the water’s edge by several metres at least. Never play shoving games near water. Your friend in the unprotected water is not something you want to see in the tropics of northern Australia. Fish safely: This photo is an example of how not to fish in the N.T. They are both standing up…. in a tinny…. in the swamps & mangroves. A recipe for disaster. Never go fishing in a tinny or other small water craft. There are crocs out there 4, 5 & although rare, around 6 metres in length and occasionally even longer, and crocs of those sizes can weigh in excess of 1000kg (1 Tonne). You may be able to out-run crocs on land, but you’ll never out-swim them. 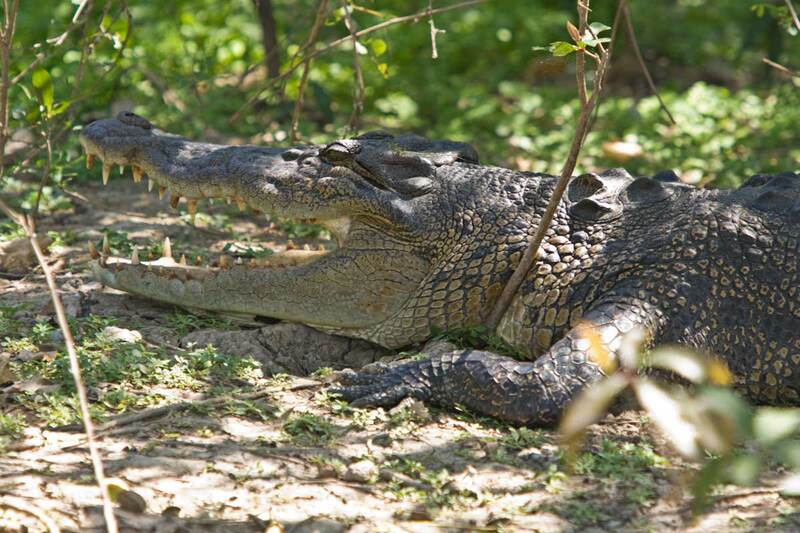 Tinnies, canoes, kayaks and other small watercraft are easily over-turned by large crocs. Once in the water, you are lunch. The operators we use are registered and insured. 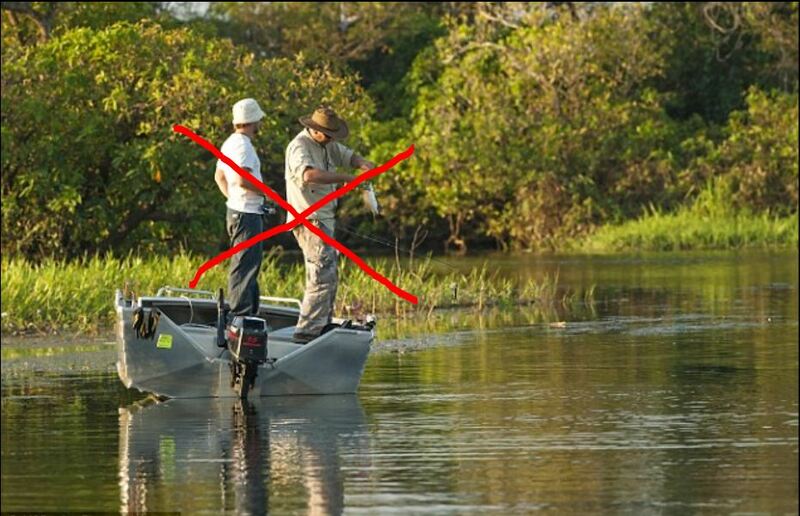 They have boats suitable for the type of fishing you want to do, blue water or mangrove & everything in between, it is all available for your enjoyment, but stay on the boat unless clearly instructed otherwise by your guide or operator. Slip, slop, slap is a good philosophy in the north. Wear a shirt/top, a hat and sunscreen, carry adequate water with you when away from camp or your hotel. It is easy to dehydrate in the heat. When boating, do so only in vessels large enough to be croc-proof. Stay clear of the edges of the boat. Sit, and keep your limbs away from the edges of the boat as well. Please don’t tempt fate by offering either yourself or your limbs as crocodile bait. Crocodiles can jump in the water. So don’t sit on the edge of a boat, a log, a wharf, a jetty or anything similar with your legs dangling either over, or in the water. Our Obligation: We are under an obligation to keep you safe at all times. Our insurance does not cover crocodile attacks. Therefore, we must advise you that should you choose not to follow these safety suggestions, you are on you own financially if anything goes horribly wrong. Travel Insurance is optional, but highly recommended. ManYou Travel offers travel insurance for the term of your travel, or longer term if you would like cover for a period of months or longer if you intend to continue traveling. Enjoy your stay with us. Our aim is to help you enjoy your vacation in the NT to the max, and to see you off safe and happy when you leave. Following these few suggestions will help you to enjoy your trip and will also help us to achieve that aim – keeping you safe and sending you home happy. Please feel free to surf our site and find the tour that suits your desires.